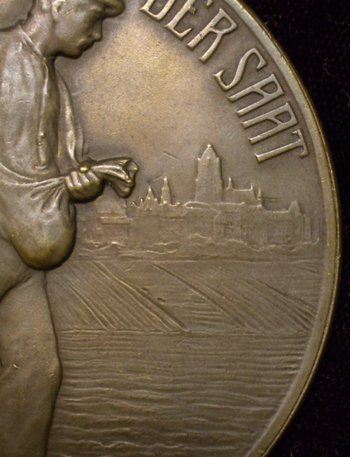 Medal Commemorating 100 Years Since the Founding of the Philanthropin Jewish School in Frankfurt am Main in 1804. The Philanthropin was a school for poor Jewish children in the city of Frankfurt's Judengasse, the oldest Jewish Ghetto in Germany. It was founded by Mayer Amschel Rothschild, with his head clerk and bookkeeper Sigmund Geisenheimer, in 1804. Rothschild was born in the Judengasse as one of eight children. He went on to become the founder of the most successful, powerful, and influential business and banking dynasty in history. This medal was issued to celebrate the schools 100th year. The Nazi party seized power in 1933 and in 1938 the Ministry for Science and Education revoked its status as a public school. By 1941 most of the students and teachers had been deported to concentration camps and murdered. Since the end of World War II it has served a variety of purposes (clinic, community center, etc.) until it was again made a Jewish school. It was renamed the I.E. Lichtigfeld School after Rabbi and teacher Isaac Emil Lichtigfeld.